Home › Dirty Politics › Singapore elected President is a lame-duck President? Singapore elected President is a lame-duck President? With the recent debates on the roles of Singapore President and what he can and cannot do, it looks more and more that the position is largely ceremonial and the President can not speak his mind in public even if he think the Government is doing wrong or having a major flawed policy that divides the country (e.g. IR). This presidency seems to be created by the ruling PAP to have a harmonious relation with the Government, that being the case, why not keep the old system instead of wasting taxpayers’ money and time to elect a president that essentially guarding the national reserve. If someone who does not have the morality and courage to speak up against the Government when they do wrong, it makes me wonder how effective he will be if he has to say NO to the free-spending Government who is determined to draw down the reserve. It seems that it is a complete useless scheme in my opinion. 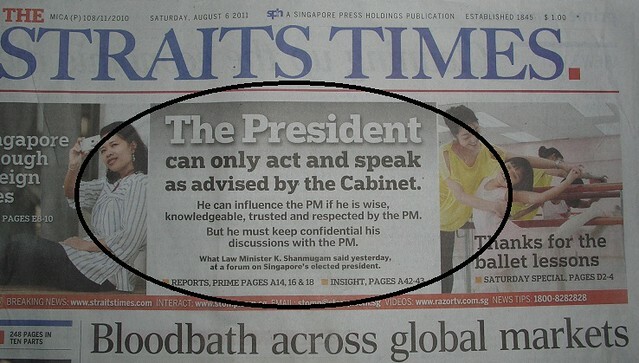 See the headline in 07 Aug 2011 screaming “The President can only act and speak as advised by the Cabinet.” and you will understand why the President thingy is flawed and a wistful thinking on the part of the PAP leaders. With less than a month to go before the Presidential Election is scheduled to be held, many Singaporeans still appear to be confused as to what the Elected Presidency is all about. This confusion over the President’s duties and responsibilities – which has led to much debate in newspapers and cyberspace – was once again reflected by the audience at an Institute of Policy Studies (IPS) forum on the Elected Presidency yesterday. Political watcher Eugene Tan – a law professor at the Singapore Management University – who was among the audience, also noted that it is important that Singaporeans get to know what the Elected President does, as the remuneration is high for a role, which attends to many ceremonial functions. The remuneration for the President and the ministers are currently under review by a committee. Law and Foreign Affairs Minister K Shanmugam noted that while it is the task of the Government to communicate clearly to the public what powers the President has and what the issues are, Singaporeans should also educate themselves. Echoing a similar view, law academic Thio Li-Ann said that voters “need to do the homework”. She noted that information on the subject is readily available, courtesy of the “valiant efforts” of the law and finance ministries to publish it on their websites. The issue of a candidate’s independence was also brought up repeatedly at the forum during the question-and-answer session. A question was raised on whether candidates who were once members of political parties would be perceived as less independent. Mr Shanmugam said one can judge a President’s independence by his ability to discharge his duties with a right mix of acumen, skill, wisdom and knowledge. “It doesn’t matter what his past affiliations were, as President Ong showed,” said Mr Shanmugam, referring to the late Mr Ong Teng Cheong, a former Deputy Prime Minister who had well-publicised run-ins with the Government when he was President. Any suggestions that only a Government-endorsed presidential candidate can be influential as the Elected President “would be wrong”, Law and Foreign Affairs Minister K Shanmugam said yesterday. Speaking to reporters after a community event, Mr Shanmugam also reiterated that whoever is elected must be respected. He was responding to comments by presidential hopeful Tan Cheng Bock, who took issue with what Mr Shanmugam had said on Friday at an Institute of Policy Studies (IPS) forum on the Elected Presidency. Dr Tan had said that he was surprised by Mr Shanmugam’s remarks, including that “whether the President actually wields influence obviously depends on who the President is”. Mr Shanmugam reiterated yesterday that the President’s influence on the Government in areas outside his constitutional powers would depend on his experience, knowledge and wisdom. He noted that the importance of credentials have also been recognised by the presidential hopefuls, as they have emphasised their specific qualifications to be head of state in the lead-up to the Presidential Election. During the IPS forum, Mr Shanmugam also pointed out that the President “can speak on issues only as authorised by the Cabinet; and he must follow the advice of the Cabinet in the discharge of his duties”. Mr Shanmugam cited Article 21(1) of the Constitution which says the President shall “act in accordance with the advice of the Cabinet or of a Minister acting under the general authority of the Cabinet”. But Mr Shanmugam also stressed that not only are the constitutional powers vested in the Elected President “significant” ones, he can also be “highly influential” on issues of the day. That, however, does not entail him speaking out in public against the Government because it would be “completely unconstitutional”.